CerAnode Technologies International manufactures a full line of Mixed Metal Oxide (MMO) Impressed Current Titanium Anodes for most every Cathodic Protection (CP) application. CerAnode™ anodes are distinctive with their unique arc-plasma sprayed surface architecture enhancement making them the most abrasion resistant MMO anode available. CerAnode™ Power Sources include Transformer Rectifiers (TR's) and Solar Power Units. 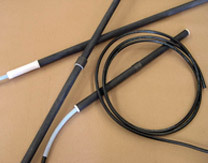 Other products include Reference Electrodes, Coupon Reference Probes and other corrosion sensor technology.